The 14 storey building will be 67 metres in height with around 301 units and retail at grade level located at 1221 King Street West. Total proposed units for both buildings is around 700 of which 580 or 78 % will be one-bedroom units, 89 or 12% will be two-bedroom units and 80 or 10% will be three-bedroom units. 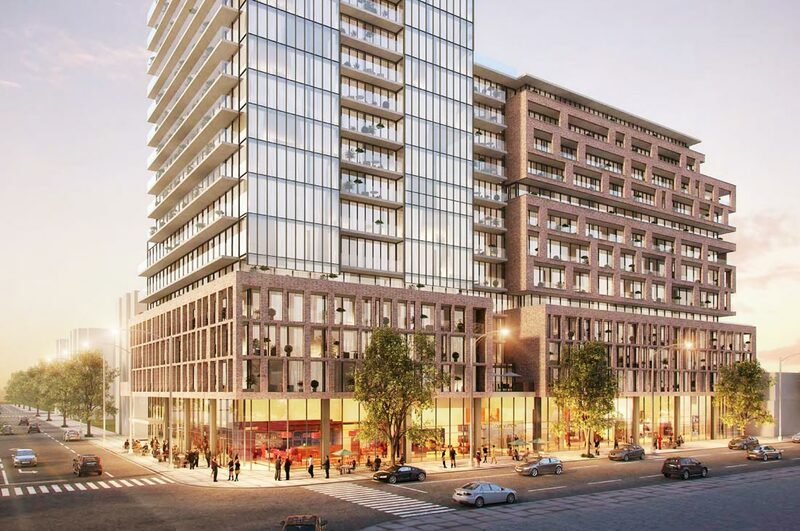 Toronto’s 1182 King St West and 1221 King St West will be home to a new condominium development, XO Condos by Lifetime Developments, currently in pre-construction stage. XO will feature two towers 17 and 14 storeys high respectively, with 701 mixed condo units in total. The two towers will consist of indoor as well as outdoor amenity space housed in podiums that prop each tower. This distinctive design will enable the two buildings to effortlessly blend into the streetscape, obscuring the lines between the vicinity and the living space. The XO Condos is located at a highly coveted address with indisputable charm and unrivalled convenience that appeals to different types of people. This historic downtown locality with rich industrial history has a wonderful nightlife and a vibrant environment which caters for the lifestyle of its residents. Here the real market continues to flourish, with the value of condos spiralling steadily lately – thanks to its local lifestyle and closeness to downtown Toronto. Liberty Village is thought to be one of the oldest settlements in Toronto. It is actually a planned neighbourhood famous for being a haven for high-tech firms, media as well as design businesses. The population currently stands at around 42,365 residents, with the majority of residents’ age ranging between 25 and 44 years. This gives it a youthful ambience. It is a vibrant Business Improvement Area where there are more than 600 businesses with over 10,000 people in employment. Although the area has many converted lofts plus heritage buildings, it boasts of chic eateries, bars, boutiques as well as services which are located among modern condo buildings. XO Condos is within few minutes to the popular Entertainment District which features the city’s newest bars, clubs as well as entertainment spots. It is also a short walk to Trinity Bellwoods Park, the Queen Street West’s chic cafes and shops as well as the Fort York Historic site. Downtown Toronto and other neighbouring areas can be quickly and easily accessed through the Toronto Transit Commission. Streetcars operate along King St & Queen Street 24-hrs a day. The area is also served by bus routes and Exhibition Station GO Transit is located a few minutes’ walk away. Motorists can easily connect to the whole Greater Toronto Area within a few minutes using the Gardiner Expressway to the south. Lifetime Developments ranks among Toronto’s leading developers of stunning and distinctive residences. The company developed the Liberty Village neighbourhood’s main commercial plaza. Some of their projects include some of the most innovative condo and hotel projects. They boast of an incredible portfolio of developments which cater for the unparalleled style, functionality and great amenities of their clients’ wants and needs. The company’s ambitious and unique projects have earned it global acclaim. The firm plans to deliver 5,000 additional units to Toronto city’s ever increasing population.